Finish up the Honey Do list i.e. fix all the stuff that’s obviously broken. De-cluttering – having a serious tidy up and throw as much away as you can. And have a yard sale. And donate to the kids. Get rid of as much as you can. Deep Clean — Spring Clean, and get everywhere. Sparkling clean is what you want – shinier than a model apartment. 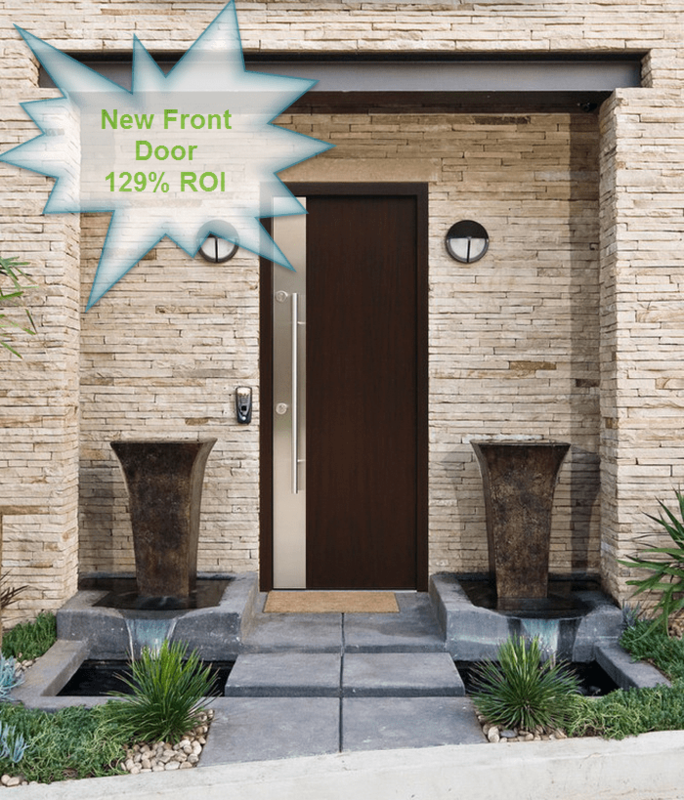 Did you know that a new front door is the best investment in terms of ROI you can make on a home? According to the 2014 Survey conducted by Remodeler’s magazine, replacing an entry door will yield 129% return on investment. 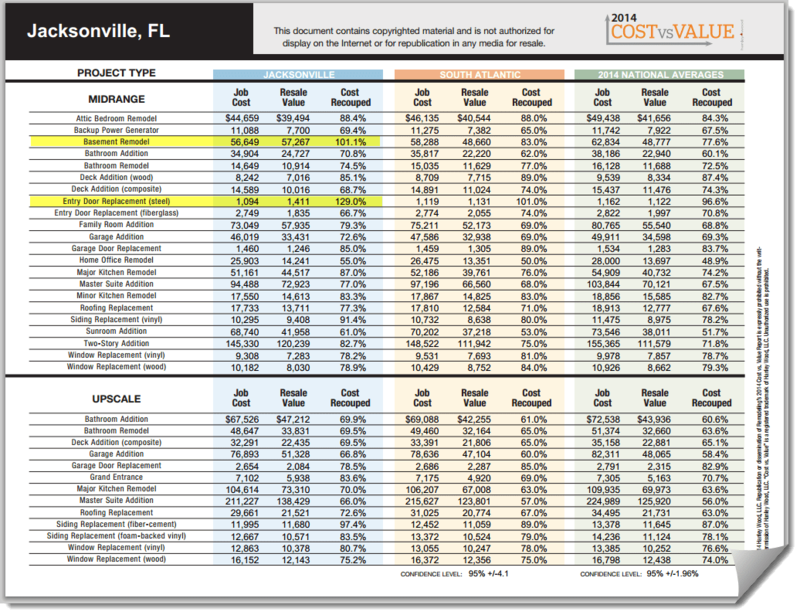 Here are the statistics for Jacksonville, FL vs. our South Atlantic Region and the 2014 National Average. I find this fascinating. I know from the HGTV shows that in cities where there are basements, that you get that money back. I certainly experienced that personally, when I added a downstairs theater to a very ordinary reno. We made our money back just as the market was falling, and were told at the time that the home theater is what clinched it. That was 6 years ago now, but still, I believe that refinished basements – adding more squre footage and living space to a home is a great way to increase it’s value. But just the front door? Here are just a few of the more interesting one on Houzz. A clean, durable door not only gives a house a crisp entry point, but also harkens back to (our instructor) Lori Kim Polk’s oroginal post “honey, stop the car” in terms of curb appeal. Curb appeal gets the potential sellers into a better frame of mind as they approach the home. They’re open to it. A pleasing entry sets the tone for the whole house. 3. It’s the first and last impression. Look, this isn’t the same impact as granite counter tops, or a whole house coat of paint, but it’s a small investment. And a good one, apparently. As we know as home stagers, the details can make or break the overall, emotional impact of a home. Can you believe this is a steel door? Doesn’t it look amazing?! We have lots more tips like this, and useful statistics to help you in your home staging career. Please check out our home staging training programs by checking this link. « RESA Stagers Team Up To Generate Multiple Offers in 24 Hrs! !